In early 1960’s the semiconductor manufacturing process was initiated from Texas and in 1963 CMOS or complementary metal oxide semiconductor was patented by Frank Wanlass. Integrated circuits are manufactured by utilizing the semiconductor device fabrication process. These ICs are major components of every electrical and electronic devices which we use in our daily life. Many complex and simple electronic circuits are being designed on a wafer made of semiconductor compounds and mostly silicon by using different fabrication steps. The complementary of the Commodore Semiconductor Group (CSG) or Metal Oxide Semiconductor (MOS) is called as CMOS technology. This technology is used in developing the microprocessors, microcontrollers, digital logic circuits and many other integrated circuits. It facilitates low- power dissipation and high-packing density with very less noise margin. It is mostly used to build digital circuitry. The fabrication of CMOS can be done by following the below shown twenty steps, by which CMOS can be obtained by integrating both the NMOS and PMOS transistors on the same chip substrate. 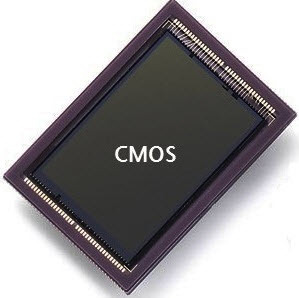 For integrating these NMOS and PMOS devices on the same chip, special regions called as wells or tubs are required in which semiconductor type and substrate type are opposite to each other. 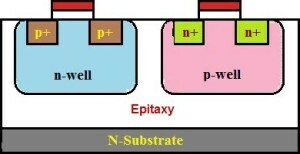 A P-well has to be created on a N-substrate or N-well has to be created on a P-substrate. In this article, the fabrication of CMOS is described using the P-substrate, in which the NMOS transistor is fabricated on a P-type substrate and the PMOS transistor is fabricated in N-well. Primarily, start the process with a P-substrate. The oxidation process is done by using high-purity oxygen and hydrogen, which are exposed in an oxidation furnace approximately at 1000 degree centigrade. A light-sensitive polymer that softens whenever exposed to light is called as Photoresist layer. It is formed. A part of the photoresist layer is removed by treating the wafer with the basic or acidic solution. The SiO2 oxidation layer is removed through the open area made by the removal of photoresist using hydrofluoric acid. The entire photoresist layer is stripped off, as shown in the below figure. By using ion implantation or diffusion process N-well is formed. Using the hydrofluoric acid, the remaining SiO2 is removed. Chemical Vapor Deposition (CVD) process is used to deposit a very thin layer of gate oxide. Except the two small regions required for forming the Gates of NMOS and PMOS, the remaining layer is stripped off. Next, an oxidation layer is formed on this layer with two small regions for the formation of the gate terminals of NMOS and PMOS. By using the masking process small gaps are made for the purpose of N-diffusion. The n-type (n+) dopants are diffused or ion implanted, and the three n+ are formed for the formation of the terminals of NMOS. The remaining oxidation layer is stripped off. Similar to the above N-diffusion process, the P-diffusion regions are diffused to form the terminals of the PMOS. A thick-field oxide is formed in all regions except the terminals of the PMOS and NMOS. Aluminum is sputtered on the whole wafer. The excess metal is removed from the wafer layer. The terminals of the PMOS and NMOS are made from respective gaps. Among all the fabrication processes of the CMOS, N-well process is mostly used for the fabrication of the CMOS. P-well process is almost similar to the N-well. But the only difference in p-well process is that it consists of a main N-substrate and, thus, P-wells itself acts as substrate for the N-devices. In this process, separate optimization of the n-type and p-type transistors will be provided. The independent optimization of Vt, body effect and gain of the P-devices, N-devices can be made possible with this process. Lightly doped n+ or p+ substrate is taken and, to protect the latch up, epitaxial layer is used. The high-purity controlled thickness of the layers of silicon are grown with exact dopant concentrations. The dopant and its concentration in Silicon are used to determine electrical properties. By using the above steps we can fabricate CMOS using twintub process method. The P-type and N-type transistors are called as fundamental building blocks of CMOS circuits. 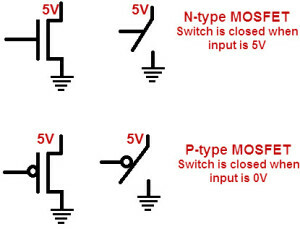 If the input voltage is low, then P-type MOSFET acts as closed switch and, if the input voltage is high, then the P-type MOSFET acts as open switch. 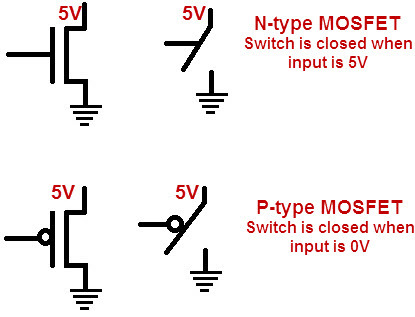 If the input voltage is high, then the N-type MOSFET acts as a closed switch and, if input the voltage is low, then the N-type MOSFET acts as an open switch. Combining the P-type and N-type MOSFETs without any conduction path between the supply voltage and the ground is the basic idea behind developing the CMOS technology. With this combination, very little energy is consumed by the CMOS circuits. 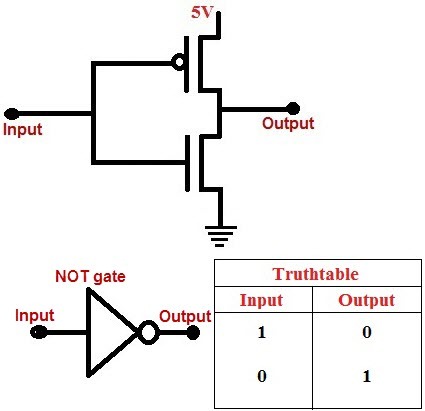 The below CMOS inverter circuit is the simplest CMOS logic gate which can be used as a light switch. If the input voltage is low (0V), then the transistor (P-type) T1 conducts (switch closed) while the transistor T2 doesn’t conduct (switch open). Hence, the output of the circuit will be equal to the supply voltage (5V). Similarly, if the input voltage is high (5V), then the transistor (N-type) T2 conducts (switch close) while the transistor T1 doesn’t conduct (switch open). Hence, the output of the circuit will be low (0V). 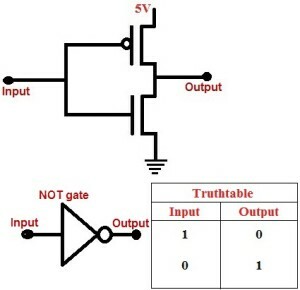 The above truth table shows the function of the CMOS inverter circuit and, from the table, we can observe that the output of the circuit is the inverse of the input. Everytime whether the input is low or high, one of the two transistors conducts such that no current flows from the supply to ground. For detailed information regarding the fabrication process of CMOS, which includes P-type and twintub processes and also advanced-fabrication process such as combination of Bipolar and CMOS ( BiCMOS fabrication), please post your ideas and queries by commenting below. sir iam from kerala..and i would like to knopw more about the project car security system using gsm….and plz help me to get the source code and circuit diagram.. Please check our model no. 154 for your exact requirement. Sorry,we don’t deal with CMOS technology. Only we deal with Embedded platform. For more details please Mr.Tarun Agarwal on +91-9908208883. thank you so much.you made everything so easy!!!!! Hello. what is the purpose of adding thick field oxide in step 16? what is the need for it? this was really helpful !! thankyou. Does N-well and P-well has the same process? I saw the project of car security system which was awesome. I am willing to make this project as i am a student of B.Tech 3rd yr (ECE). So i request you to please help me by sending the code to the given mail id. As per your query, I can suggest you that, we provide you DIY (do-it-yourself) kits. With these kits, you can get practical knowledge. once you purchase the project from our website http://www.edgefxkits.com/, you will be provided with all support documents, components, soldering kit, and video tutorials. I forgot to mention the model no. initialy i was not aware much about the fabrication but after seeing your notes all doubt are clear easly… thanks..
That was really a good and simple explanation.I loved it.I just had 1 question.Why do people start with P-substarte as base wafer ,what advantage does it provide over n-substarte. It is because of the convention that the power supply is positive with respect to common (ground). It would be entirely possible to fabricate it with an N type substrate and P wells for a negative power supply, but charge carriers are less mobile in P-type so that would result in longer propagation delays. An N to P junction is reverse biased when the P is at a lower voltage than the N. That allows simple isolation for NMOS transistors. PMOS transistors are fabricated in a N type well for the same reason. In the diagram below, the contact B on the right is the positive power supply, the B on the left is the common (ground). The entire P substrate is at ground potential. THANK YOU SO MUCH FOR YOUR FAVOURABLE REPLY. this was really helpful for me! thank you so much! can you help me about BiCMOS fabrication Technology? The contents of this website ” http://www.elprocus.com” were not so detailed about BiCMOS fabrication.